1) Heat oil in a medium skillet over medium; add ginger, lime zest, and red pepper. Cook until just browned, about 30 seconds, stirring. Remove from heat; whisk in lime juice. Season to taste. Set aside. 2) Preheat grill to medium; brush gently with oil. Grill trout fillets until fish turns opaque, turning once, about 4 minutes total. Remove trout from grill and arrange on serving platter. 3) Pour lime dressing over trout and serve immediately. I wasn't wild about the amount of oil this recipe has but it has much potential with some slight modifications. Use less oil, add the mix inside the trout and cover with aluminum foil. That's my modification to this :) It was good, just need a bit more inside taste than outside crunch. Lime makes it too bitter, I added sherry which did improve it but the bitterness was still there. I wouldn't do it again. I really liked this recipe. I used all the same ingredients, but used my own judgments on the amount. Excellent. I did add 1/4 tea garlic and a 1/4 cup toasted almonds. Average rating of 3.50 stars based on 4 reviews. 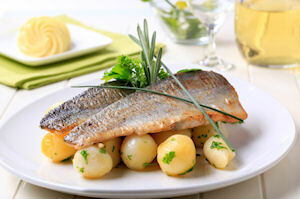 Summary: Farmed rainbow trout are an environmentally-friendly (and very economical) ways to enjoy seafood regularly.